It's official: The rainy season has started in Japan. The NHK nightly news announced this week that we're in for a wet, humid, and rather uncomfortable June. After the driest May in years, this month is supposed to be particularly damp. But don't let the rain get you down! Not only are there plenty of great things to do in Kyoto on a drizzly day, but the rainy season brings with it a chance to spot some rare creatures called "yokai" that have haunted the homes and forests of the Japanese islands for centuries (...maybe). — Hiroko Yoda and Matt Alt in "Yokai Attack!" That's right, yokai aren't real of course. Sorry to burst your bubble. As fascinating as the yokai are on their own, it's the stories and reasons behind them that I find all the more interesting than the gruesome creatures themselves. Yokai were created to explain the natural world and offer suggestions for how to deal with problems. They were also used as teaching tools to impart folk wisdom and important lessons to uneducated villagers and young children. Much like the medieval fables of Europe, yokai stories were told to all children growing up to frighten them into behaving properly (the breadcrumbs that Hansel and Gretel followed would probably come to life as yokai in a Japanese retelling). But let's suspend disbelief for a moment and take a look at the 5 yokai that you just might meet when visiting Japan in the rainy season. All of these monsters are known to appear specifically during rainy weather, making this the perfect time to go out hunting for yokai. I'm not promising that you'll see any during one of our exclusive tours of Kyoto, but it might be wise to keep your eyes open and your camera ready! The Legend: Let's start with a relatively tame yokai. The amefuri kozo is a mischievous boy who likes to play in the rain, and is often seen splashing around in puddles and soaking passersby. He appears wherever rain might fall, and seeing him often means more rain is on the way. The umbrella hat on his head keeps his childish face dry, but be careful not to steal it from him. If you put the umbrella on your own head, you'll never be able to take it off and rain will follow you forever. In essence, you become an amefuri kozo yourself. And that's not a yokai that you want to be, because this wet little boy is often on the receiving end of bullying and jokes from other more important and far more fearsome yokai. The Reality: Even if this yokai is harmless (and a little pathetic), it's probably best to avoid him. Therefore, the moral here is that it's best to stay indoor on rainy days. Drainage and waterways were not so developed in the old days, so being caught outdoors in a major storm in medieval Japan was not a place you wanted to be. This goes for kids playing in the rain as well. I can just imagine mothers in the Edo Period scolding their kids... "Get inside and dry off! You don't want to become an amefuri kozo, now do you?!" Also, this yokai teaches us something about stealing umbrellas from the public racks outside of shops and hotels. What if the umbrella you snapped up when no one was looking actually belonged to an amefuri kozo...? The Legend: This little creature is one that we've all encountered at one point or another. As you're walking down a rainy street, the sunekosuri darts out from the shadows and scuttles his way between your legs. Don't mistake that fuzzy rub on your shin for a friendly cat; this yokai is all about causing you to trip and fall headfirst into a puddle. Often said to look like a small dog, the sunekosuri is actually quite cute. Is it trying to trip you on purpose, or is this a product of its over-eagerness to rub up on your leg? No one knows, as no one has even seen a sunekosuri on a dry day to see how it behaves when the sun is shining. Said to smell like wet dog (duh). The Reality: What can be can't be explained by the supernatural is in this case easily explained by good old human clumsiness. 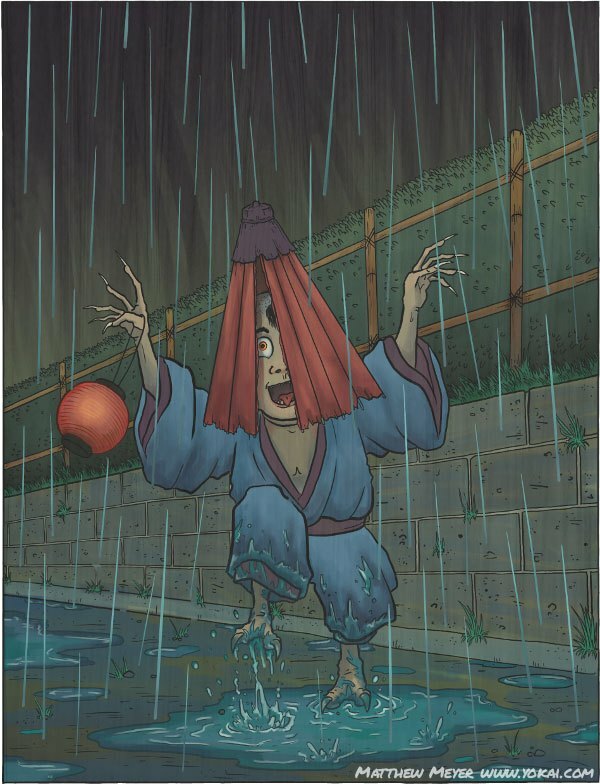 We don't need sneaky yokai scampering about our legs to trip us up when the rain is falling. This yokai tale is all about taking extra care when walking in the rain. Even on paved roads nowadays things can get pretty slippery. Imagine how treacherous things would have been back when everyone was forced to trudge along muddy roads! The Legend: When a living thing dies, the remaining spirit energy occasionally coalesces into a fiery orb at the moment of death and remains in this world. These glowing balls can range in size from flickering candle flames to the size of a human head. Sometimes they even have faces! Often spotted on warm, drizzly evenings in summer, onibi are known to lead you into danger. If you follow one of these orbs into a forest, swamp, or pond, there's a good chance you won't be coming back. The Legend: Mold is very common in the wet, humid Japanese climate, and red mold in particular often appears in bathtubs that haven't been cleaned properly. That's when this yokai shows up, as the akaname is all about eating that delicious red mold growing in the cracks between bath tiles and wooden bathtub boards. The akaname usually stays inside the drainpipe and extends its long, slimy tongue up into the bath and licks up the red slime. Countryside wisdom says the saliva from the akaname can cause disease and make wounds fester. These yokai often appear during the rainy season, when mold of all colors seems to grow in all sorts of unexpected places in Japanese homes. Once in a while, this yokai will even venture out of the bathroom and into the house to lick at surfaces in the kitchen. Delightful, huh? The Reality: The akaname legend is a warning against dirty bathtubs, since the red mold that grows during the humid months can actually cause some serious health issues. Surprise, it's not the poisonous saliva of the yokai that's making you sick, but the mold itself. The threat of an akaname is still often used to get children to do their bathroom chores. "Did you scrub the bathtub? If there's any red mold left, an akaname will come to lick it up!" The Legend: The kasa obake might look otherworldly, but it was once a regular umbrella. Discarded and tattered, it shifted into a troublesome yokai due to the fact that no one disposed of it properly. Items left unattended for 100 years can shift into tsukumogami, a special type of yokai that seeks revenge on humans for being treated so poorly. See the sandals and ricepaper screens in the picture to the left? Those items are capable of becoming yokai as well if left uncared for. A kasa obake rarely causes much more than an annoyance, but they're notoriously hard to capture. That old umbrella you saw flying down the street the other day... was it being pushed by the wind, or was it a kasa obake hopping along? The Reality: Japanese folk wisdom tells us that everyday inanimate object have their own life. They're made, used, and eventually "die" when they fall apart, so they deserve our respect. In Kyoto, there are temples that have "graves" for objects like hair pins and calligraphy brushes where you can safely deposit your well-worn items for ceremonial cremation. If you simply let these objects sit in your house, they are said to turn into tsukumogami and haunt you. The kasa obake myth is a strong admonition against gathering unwanted junk and hording useless items. You'll see LOTS of potential kasa obake in the umbrella racks at train stations all over Japan! Yokai are one of the most interesting and fun aspects of Japanese mythology, both for their wild appearances and the stories behind them. For more info on these monsters, check out Yokai.com, and amazing compendium of yokai in English. All pictures in this post and much of the background info is borrowed from that site. There are plenty more rainy yokai that I didn't include here, so make sure to keep a sharp eye - and an open mind - when you're out and about this season! Maybe you'll spot a Sarugami during a walk through rural Arashiyama, or a Teratsutsuki flying over the giant Buddha temple in Nara Deer Park.